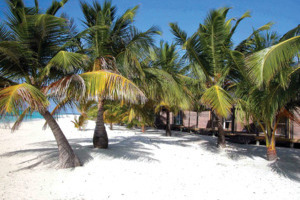 On the 40-minute sea plane flight from Malé Airport you will see many beautiful sights, but none as beautiful as the paradise that is Kuredu Island Resort. 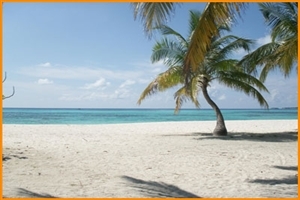 With over 3km of white sandy beaches to explore, a turquoise lagoon and luxury accommodation, this is the ultimate beach holiday destination. 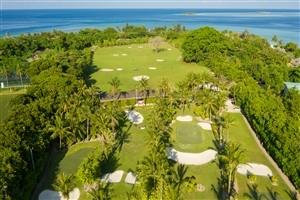 Whether you are staying in a Garden Bungalow with butler service situated just steps away from the beach, a secluded Sultan Villa with a private pool placed among lush tropical gardens, or a Beach Villa which opens up onto gorgeous white sands and magnificent views of the Indian Ocean, this is sure to be a trip of a lifetime. 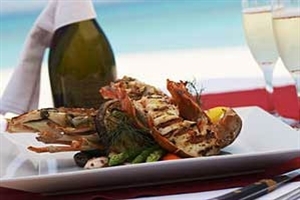 The island itself is populated by exquisite restaurants which offer cuisine that spans the whole world. 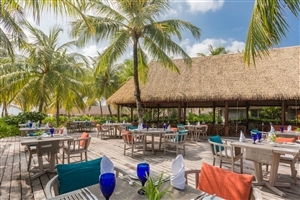 You will find local Maldivian delights in The Beach Restaurant, beautifully prepared Mediterranean food in Franco’s Restaurant and you will discover the entertainment and satisfaction of teppanyaki in The Far East Restaurant. 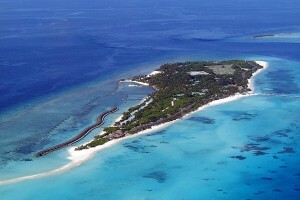 Off the island you will discover a world of wonder and life via scuba diving through the PADI diving centre or taking a magical cruise on a dhoni (traditional wooden boat) in which the musicians pound their drums to attract mischievous dolphins. 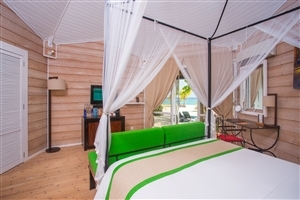 This all-inclusive island paradise is perfect for a fun filled family holiday, a relaxed beach holiday or memorable romantic getaway. 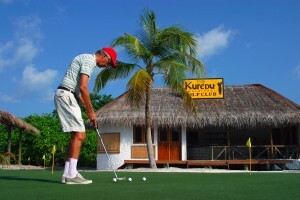 Fun is to be found all over the island in the form of volleyball, football, tennis, and badminton facilities. 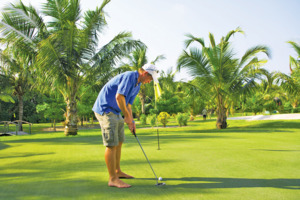 Further to this, there is a golf course and driving range on the east of the island which will enable a perfectly relaxed round as the only noise you can hear is the gentle flow of the ocean. 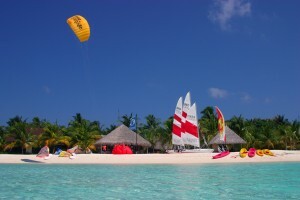 Off the island the ocean is tailored for your enjoyment with the resort catering for wake boarding, kitesurfing, parasailing, windsurfing, banana boat rides, pedalos and canoes. 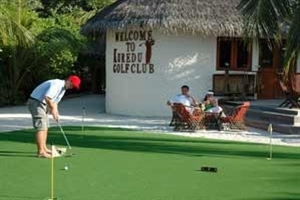 This is the perfect place to try something new. No need to worry about falling in as the water is delightfully warm anyway! Back on the island bars are to be found all over so that you will never be far away from your favourite cocktail. 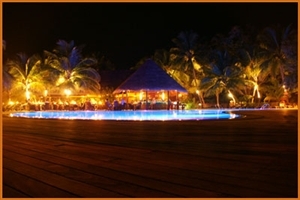 The Sunset Bar is the most popular due to its enviable position which always provides the ultimate romantic sunset. As evening falls on an action packed or lazy beach day prepare to be entertained by live bands and DJs who perform every night at different locations throughout the resort. 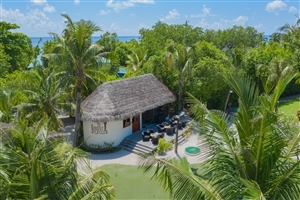 Situated by the beautifully landscaped garden, and mere footsteps away from the beach, the Garden Bungalows are perfect for taking in every aspect of the island. 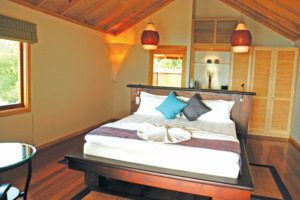 Providing 56sqm of space, these bungalows can comfortably accommodate three adults, or two adults and two children. 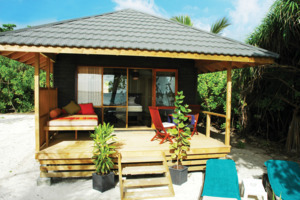 The beach bungalows are perfect for families and groups. 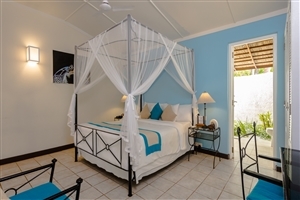 These recently refurbished bungalows offer 56sqm of space, which includes an open-air bathroom, walk in shower and four-poster beds that have been stylishly furnished. 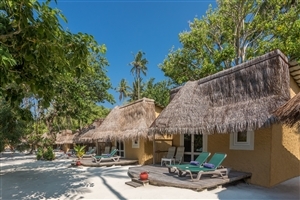 With 60sqm of accommodation space, the beach villas are not only spacious, they are also perfectly placed. 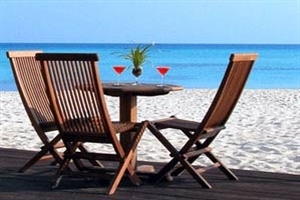 These villas provide a bedroom, sitting area, garden, open-air bathrooms, walk in shower as well as a veranda, offering spectacular views of the ocean. 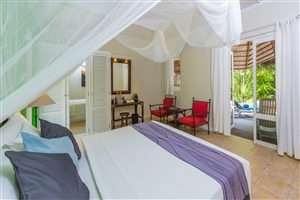 The Jacuzzi Beach Villa offers 76sqm of accommodation space a private garden, outdoor wooden deck and Jacuzzi, as well as splendid views. 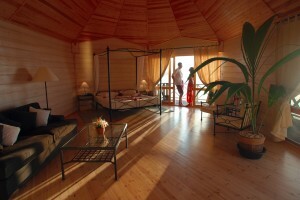 These villas also include an open-air bathroom and furnished terrace. 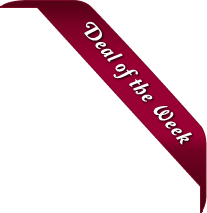 This is the perfect choice for comfort and relaxation. 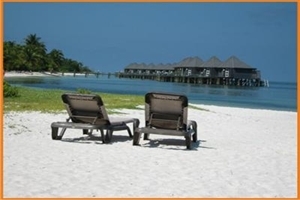 If you want to experience the magnificence of your location, stay in a Sangu Water Villa. 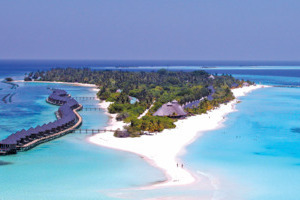 These villas are situated on wooden stilts above the tranquil lagoon, providing unforgettable 360-degree views. 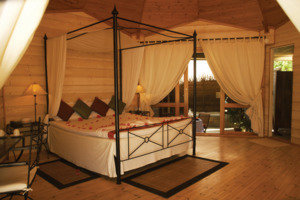 Enjoy 70sqm of space, a king sized four-poster bed, a spacious outdoor decking area. 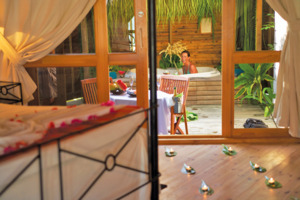 The Sultan Pool Villas have their own private beach cabana, a 4x10m swimming pool and exquisite gardens. The interior features an array of excellent amenities, such as a walk in shower, as well as stylish furnishings. You can choose to have either one or two bedrooms. 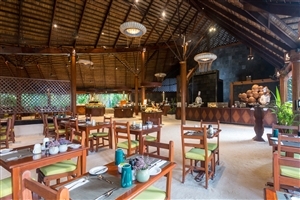 Koamas Restaurant offers show cooking for breakfast, lunch and dinner. This is a buffet with a fantastic range that will become your go to restaurant. Franco’s Restaurant brings all the tastes of the Mediterranean to the Indian Ocean with a wide range of pizzas, pastas, tapas and more. 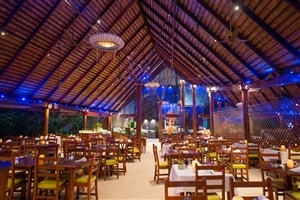 The Beach Restaurant provides an authentic Maldives taste which is perfect for those wanting to try the local cuisine. The Far East Restaurant brings you the tastes of far off Japan. 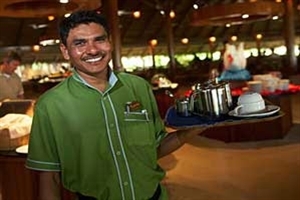 It also allows you to experience the always entertaining and therefore always satisfying teppanyaki. 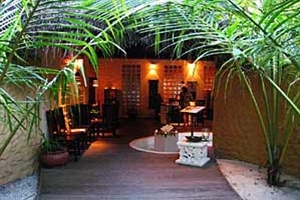 The Sai Kotari Tea House is located on the end of the harbour and offers guest a secluded, romantic spot to try its fabulous range of specialty teas. 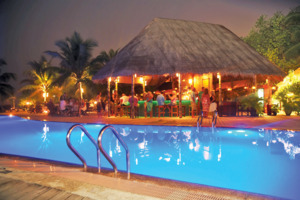 The Babuna Bar is the main bar on the resort. If you are looking for a party head this way!